Showing 11 articles from March 15, 2015. State shellfish managers have approved a series of razor clam digs that starts Monday (March 16) on evening tides, then switches to morning tides Saturday (March 21) for four more days of digging. What kinds of legal documents are suggested for end-of-life plans? I would like to get my affairs in order before it's too late. Lewis County Medic One has reported a lapse in shift coverage during Wednesday and Thursday of last week in light of ongoing staff shortages, with additional shifts expected to go unfilled later this month. Union President Brad Flexhaug stated, on the evening of March 11, one of their two stations, near Mary's Corner, had gone multiple hours without a paramedic on staff as the scheduled paramedic left early in light of a family emergency and no other employees were immediately available to fill in. 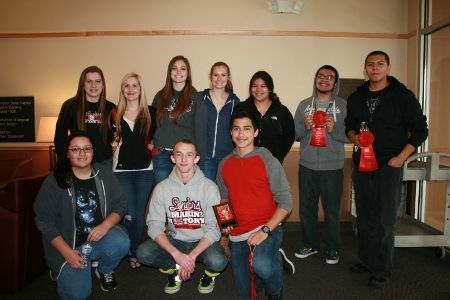 The Raymond High School math team went to Tumwater for the Region 9 contest and came away with a first-place finish in the Team Problem on Finance and a second-place finish in the Topical Problems section. In front from left are Justine Vaca, Ben Meade, and Carlos Cruz. In back from left are Karlee Freeman, Dani Messer, Mikayla Collins, Kendra Dunsmoor, Johanna Crow, Gen Gen Quintana, and Josue Quintana. The Willapa Players will be presenting, Play On! a comedy by Rick Abbott for their winter show at the Hannan Playhouse in Raymond. The production is under the direction of Dave Lund and Emily Popovich. Performances continue March 20th & 21st at 7:30 pm., March 22nd at 2 pm. and March 27th & 28th at 7:30 pm. OLYMPIA - Washington continues to enjoy steady momentum when it comes to employment and new jobs, the state's labor economist said today. Thomas E. Levy, MD, JD, and Robert Kulacz, DDS, explain why your dentist may play a much more integral role in your cardiovascular health than you ever suspected. Henderson, NV (March 2015)--Chances are, you know that heart disease is the leading cause of death in the United States. And whether or not you choose to incorporate preventative measures into your lifestyle, you also know that diet, exercise, not smoking, reducing your stress levels, and more can reduce your risk of experiencing heart disease.